Any additional elements added to a browser increase its memory usage, whether it be a plugin for Chrome or Firefox. One of the more popular is AdBlock, which, as its name suggests, filters out the annoying ads that unfortunately pay for the salaries of sites like PCWorld and others. AdBlock Plus has over 19 million users on Firefox alone. 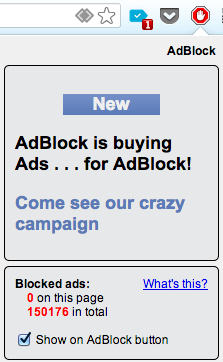 AdBlock sits in your browser and quietly stomps ads. For a site with a high number of ads, filtering those ads can put a strain on the browser's memory consumption. Browsing one site, for example, without AdBlock consumed 194MB of memory. That leapt to 417MB with AdBlock on, according to Nicholas Nethercote, a developer for Mozilla who outlined some of the problems in a blog post. Using another test site, memory usage jumped from 370MB to a whopping 1,960MB with the AdBlock plugin enabled. According to Nethercote, simply enabling AdBlock Plus consumes 60-70MB on a 64-bit build of Mozilla. But the plugin also consumes 4MB or so per iframe, which pulls in content from an external site. The reason, according to AdBlock, is twofold: one is a bug in which the way Firefox handles stylesheets, and the other is simply the way in which Adblock stores its filters. So what can you? Apparently one solution is either to ditch Firefox for now or turn off AdBlock entirely. Palant also wrote that AdBlock hopes to come up with a new way to implement and store data, as well as determine which filters are actually being used and which have become unnecessary. Until then, you'll pay in terms of memory consumption what you'll avoid in loud, squalling ads.